This is a repeat card, one that has come up often for me and seems to tie in perfectly with today’s Tarot and my recent thinking patterns. I also feel inclined to note that I re-took that Chakra Test this morning and learned that my third eye chakra is extremely over-active, as is my throat chakra (communication). I’ve got a few books here on Chakra healing, cleansing, and balancing – that include physical exercises one can do to get things back in order. Since exercise and physical health seem to be a theme for me at the moment, it’s probably a good idea to do some quiet meditating and some personal chakra work. Toxic energy, whether it comes from drugs, alcohol, poor diet, or negative influences, can seriously impact the way we think, feel, or function in daily life. If drugs and alcohol are in use (which they are not in my current circumstance, with the exception of cigarettes), this card signifies a time to let go of those addictions so that life can be seen from a clear and straight perspective. If drugs and/or alcohol are not in use, perhaps the diet needs a review – what is being consumed that may be unhealthy to the body? And if the diet is in good order, one must reflect on what other influences in their life may be considered toxic, and begin eliminating those toxic energies. In order to move forward successfully, body, mind, and soul must be detoxified. I’m probably being given a nudge here about smoking, which I’ve been considering quitting but have not yet committed to, and to my diet. I only eat one meal a day, usually – and it most often comes from the restaurant where I work. Not exactly what I’d call a healthy diet. I also consume entirely too much caffeine by way of coffee and Mountain Dew. Coupling this card with this morning’s Tarot, Queen of Pentacles, it may be a good idea to think about growing some of my own foods and herbs in a garden. I told my kids just last week that I wanted to start an indoor herb garden. Then again, I can also pin-pointedly mark certain external influences in my life who I’d consider to be “toxic energy”. 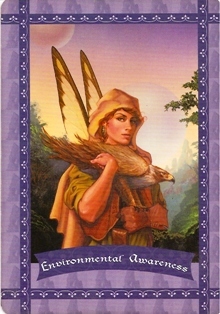 Card Meaning: You are being guided to clean your body, environment, mind, and heart of toxins. God and the fairies will help you with this endeavor. 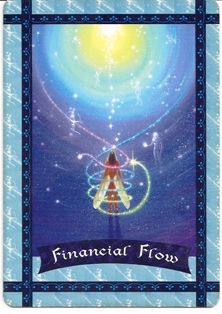 Card Description: It’s time to let go of toxins, within and around you. This card validates your inner guidance that has been telling you to let go of harmful habits. Go outside in nature, and call upon the fairies to surround you. 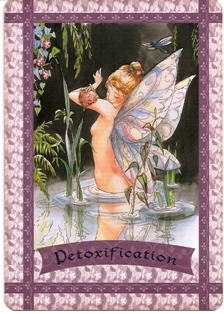 Ask God and the fairies to help you release toxins from your mind, body, and heart. Ask them to help you release your cravings for harmful habits. You’ll soon find yourself naturally desiring organic fresh food and produce. You’ll be guided to read ingredient labels of all foods, beverages, and toiletry items, and you’ll only want to use natural products. You’ll be guided away from environmental toxins. And, most important, your thoughts and emotions will veer away from judgment and fear, and will become love-based instead. Affirmation: I take excellent care of my body, and I crave only healthful foods and beverages. Ouch… This one instinctively punched me in the chest and brought tears to my eyes. But why? Have I lost hope for my own happiness? *sigh* Surely not. *Even heavier sigh*. Like The Hermit, this is her first appearance here on The Road Home. When a fairy appears inverted, it means she’s really, really trying to get your attention. She’s lighting herself up, flapping her wings, and tugging at your shirt-sleeve. 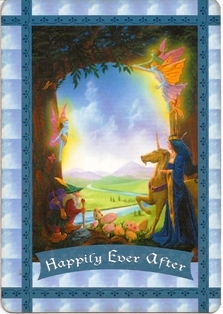 Card Meaning: A happy outcome is assured. Release any anxiety, and feel secure that everything is resolved in the end. Card Description: This is a reassuring card signaling that the “movie” you are currently starring in has a very happy ending. Situations that appear sticky are miraculously resolved. Misunderstandings are forgiven. Mistakes are forgotten. You are urged to stop worrying about the future, as your fears could be self-fulfilling in a negative way. You could literally sabotage heaven’s happy plan for you if your worries are excessive. So, go outside in nature, and ask the fairies to help you rejoice in the perfection of Creation. Your joy renews your faith, and ensures the happy outcome that is in store for you. Affirmation: Everything is in Divine and perfect order, right now. This card has been following me for some time, now. Certain dots are trying to connect themselves in my head here… about how I just recently posted about being a “seer” and how frustrating it is when we realize we’ve blinded ourselves to the truths of our own circumstance. I also wrote of how I sometimes feel odd about trying to offer direction to others via readings, etc. when my own life seems to be in such a state of disarray. The other day when I drew this card, I associated her to manifesting my dreams… the magick shoppe, etc. Today, however, she reaches a little deeper, tapping into that psychic wavelength. 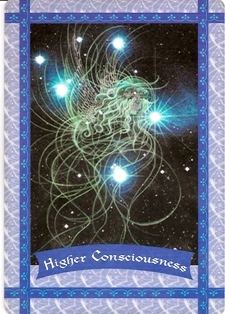 Card Meaning: Your clairvoyance, your dreams, and the pictures in your mind’s eye are becoming more clear and powerful. 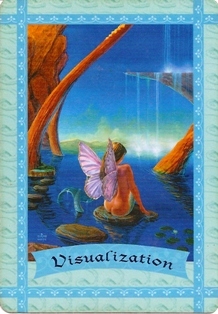 This card asks you to trust and to develop your visual skills, and to use them in conscious manifestation. 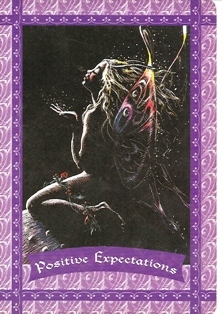 Card Description: The fairies know the power of conscious visualization as a tool of manifestation. By drawing this card, you are guided to sit quietly on a daily basis and to visualize yourself living a healthy, happy, abundant, and meaningful life. Visualize only what you desire, and avoid picturing that which you do not desire. You have powerful visual skills, even if you’re unaware of them. Affirm daily, “I am a highly visual person.” Any blocks that you have about clairvoyance will begin to lift. Know that it is safe for you to see the future, the spirit world, and the truth about your life. By releasing any fears about “seeing,” your visualization powers will be greatly magnified. Affirmation: It is safe for me to see. I am a very visual person. Indeed, I understand exactly why I drew this card reversed this morning. I’m just emerging from this mini-depression I was in (oh, Wendi, remember the Wheel of Fortune card from July??). I had been all excited and anticipating a move, then I found out I’m stuck right where I am. I was just starting to get to a semi-secure place financially when I hurt myself and got set back ten paces by missing a week’s worth of work. I was just getting comfortable with the T situation when life took over and kept us both busy and distant. I was just getting comfortable with the healing my daughter and I were doing, then she started high school and ended up right back with the influences that sparked the trauma and drama of last year. I was just getting nestled into my blog when I realized it can’t host Google Adsense, Amazon affiliations, or other code I was hoping to use to begin converting the blog to incorporate the beginnings of a store – and wondered if I need to scrap the whole thing and start over. Everything I felt confident about suddenly slipped out of my reach and I spiraled into this dark pit of fear, insecurity, doubt, failure, and self-depreciating tendencies. That’s why this card shows up reversed. She reminds me not to lose hope, not to expect the worst – because if I do, that’s what I’ll create. She encourages me to remain positive, to continue to dream, to hold onto faith because, as cliche’ as it sounds, this too shall pass. Card Meaning: Keep up your hopes, dreams, affirmations, visualizations, and prayers, as they will be wonderfully manifested right now. Don’t quit five minutes before the miracle occurs! Description: You’ve planted the seeds of manifestation with your positive thoughts and emotions. Yet, you may be discouraged occasionally because you aren’t seeing immediate results. You start to have pessimistic thoughts and wonder whether your faith is unjustified. Hold on to your faith, though! Although your manifestation is taking longer than you’d hoped, it is coming to you. You certainly don’t want to cancel or cloud your manifestation with miscreations that come from negative thoughts. At your earliest convenience, go outside in nature — even a backyard or small park will do. Mentally converse with your friends, the fairies. They are absolute experts at manifestation! Tell them about your doubts, fears, and disappointments, as well as your hopes and dreams. Ask the fairies to help you release any negativity you may have, and feel them surround you with healing love and light. Affirmation: I am safe, confident, and secure. I feel joyful about my future.